Polymethylmethacrylate (PMMA) is a synthetic, biocompatible substance that has been used in medicine for much of the last century. In dermal fillers, PMMA takes the form of a “microsphere” or tiny ball, that remains beneath the skin indefinitely to provide continued support. PMMA fillers will also contain collagen, a naturally occurring substance in the skin that provides structure and firmness. 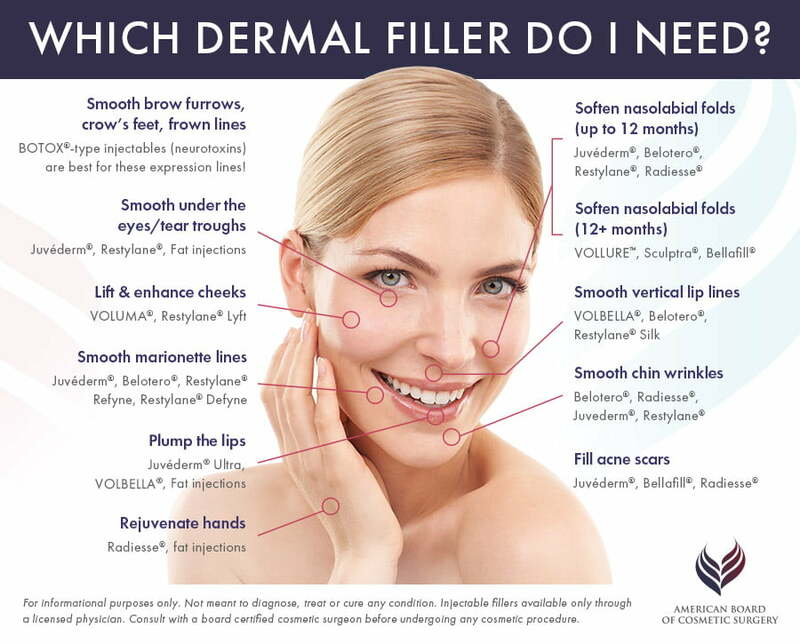 FDA approved PMMA fillers include Bellafill® (formerly known as Artefill). Whomever you choose, make sure your provider has a proven background in cosmetic medicine as well as training and substantial experience performing filler injections. Ask to see before & after photos of a potential provider’s patients. If an R.N. or physician’s assistant will be performing your injections, that person should be working closely under the supervision of a qualified physician, preferably a board certified cosmetic surgeon. Facial fat grafting is a surgical procedure and follows a different treatment protocol. Typically, fat grafting is performed as an outpatient procedure, using general anesthesia or local anesthesia with sedation. Up to 2 weeks of downtime may be required, depending on the extent of liposuction performed. Your cosmetic surgeon will go over what to expect with surgery and recovery during your consultation. With the help of an experienced, qualified provider, injectable fillers can provide natural-looking enhancements to help you feel more confident in your appearance. If you’re ready to learn more about your options, the next step is to meet with a board certified cosmetic surgeon for a consultation. You can use our ABCS Find-a-Surgeon tool to locate a cosmetic surgeon near you.